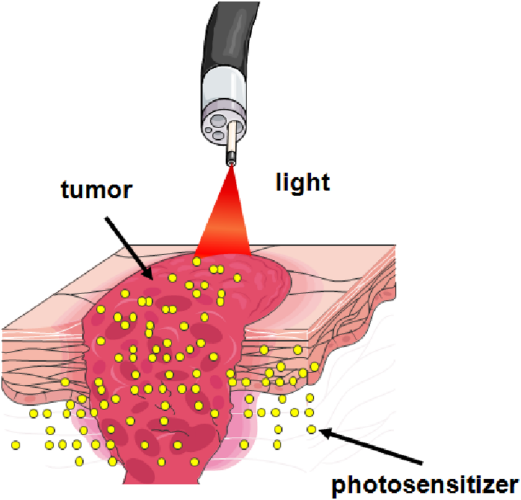 Photodynamic therapy (PDT) is a common term in the medical community which has been used to describe treatments ranging from near-infrared laser-induced vascular dilatation to photo-thermal excitation of nanorods embedded in cancer tumors. For the purposes of this blog, we are going to focus on a rapidly growing subset of PDT where laser light is used to activate both dermal and subdermal treatments utilizing a specialized drug, called a photosensitizing agent. In this application, the laser in effect serves as a “key” which allows for the active pharmaceutical ingredient to be selectively “turned on” when excited by a specific wavelength of light. This drug can either be injected into the bloodstream through a vein or applied topically to the skin. PDT has been shown to be as effective as surgery or radiation for treating certain cancers, without the risks of invasive surgery or the long-term side effects of radiation treatment. Additionally, it allows for the procedure to be highly targeted since the impact of the drug is localized to the region of the body which is illuminated by the laser source, as shown in the figure below. Since PDT can only treat areas where light can reach, it is typically limited to treating dermal and subdermal tumors, although it has also been used endoscopically as well. A comprehensive review of the biophysics behind PDT is beyond the scope of this blog post, but it is valuable to look at the importance of excitation wavelength for dermal and subdermal PDT by taking a brief look at the absorption and scattering properties of tissue. While intuitively it may seem evident that shorter wavelength lasers would serve as a better excitation source for the photosensitizer, due to the higher photon energy, but the shorter the wavelength of the photon the less depth penetration they have because absorption and scattering cross-sections are inversely proportional to wavelength. One study on the topic in which a detailed computer model was developed to describe how human skin reacted to various wavelengths presented in 2011 by Mustafa, Et al. from the Universiti Sains Malaysia, School of Medical Physics. In the presentation they demonstrated a realistic skin model where they simulated the absorption and depth penetration laser wavelengths ranging from 308 nm to 635 nm, showing that red light was absorbed at approximately 1/7th the rate of ultraviolet light allowing for up to 5 times deeper depth pentation. 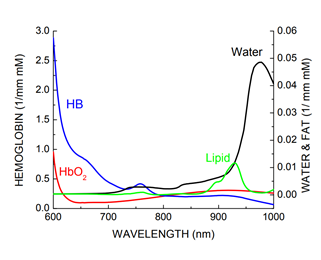 On the other end, once you move above the red and into the near infrared region of the spectrum not only does the photon energy further drop but, as shown in the figure below, both the lipid and water absorption starts to increase. As a result most commercially available photosensitizers are engineered to have absorption peaks in the 630 nm to 750 nm range. For example, HpD (Photofrin®) activates at 630 nm, PpIX (ALA) at 635 nm, mTHPC (Foscan ®) at 652 nm, BPD-MA (Verteporfin) at 690 nm, and Lu-tex (LUTRIN ®) at 732nm. At RPMC Lasers, we are proud to offer a wide range of multi-mode fiber coupled laser diodes between 630 nm and 750 nm from LDX Optronics with output power up to 2 watts. LDX Optronics, specialists in high power diode lasers, offers a wide range of laser diodes which are ideal excitation sources for PDT applications, particularly in the case of cancer treatments. Here at RPMC Lasers, we are excited to be the exclusive worldwide distributor for LDX Optronics; offering a wide range of laser packages which are ideal for integration into commercial photodynamic therapy systems. These compact 105-micron core fiber-coupled diode laser lasers are available in a wide range of compact configurations including TO cans and butterfly packages making them not only for dermal and subdermal treatments but also for integration into endoscopic based PDT instrumentation. For detailed technical specifications on the diode lasers offered by LDX Optronics click here or talk to one of our laser experts today by calling 1-636-272-7227.